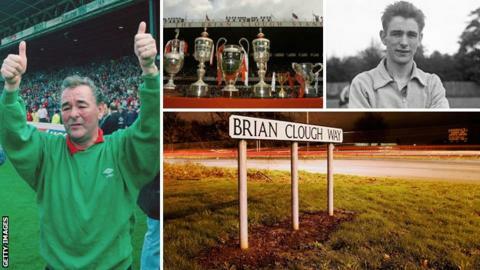 It is 10 years since Brian Clough - arguably football's greatest character - died of cancer aged 69 on 20 September 2004. His achievements in the game as a prolific goalscorer with Middlesbrough and Sunderland and legendary manager at Derby County and Nottingham Forest would place him in the football pantheon anyway. But what set him apart was personality - his ability to transcend his sport. Clough was a genuine one-off and there are more anecdotes about him than anyone else in the game. I knew Clough for more than 30 years. I wrote a book about him - His Way, The Brian Clough Story - and was one of the lucky reporters to have a fruitful working relationship with him. He truly was a remarkable man. I'm convinced that Brian would have made a good journalist. He had a great ear for the telling phrase and he respected reporters who had done their time and had opinions of their own. "That Sinatra, Patrick - he's met me, you know." "That Portuguese bloke at Chelsea, Jose what's his name... He reminds me of me at the same age. But I were better-looking." "What's coaching? I'll tell you - getting that Roy McFarland [who played for Clough at Derby County] to get his hair cut!" "Which current managers remind me of meself? Alex Ferguson for his consistency and bravery. Neil Warnock - without the success." "Our team's so young, it's like a school outing. Our problem isn't injuries - it's acne!" We did a programme together for BBC's World Service in 2003 in which he picked his favourite XI - with Johan Cruyff, Gerd Muller, Bobby Moore and John Charles selected. I asked him who would be the manager and was not surprised at the answer. "Well it'd have to be someone who's played a bit, could talk about it clearly without waffling on as if he was Albert Einstein, someone who wouldn't be afraid to tell that Cruyff bloke to pass the ball. I suppose it had better be me!" It was a tongue-in-cheek answer, but he was convinced he was the right man for the job. He had utter conviction laced with humour - his forte. The only thing he was afraid of was flying. You turned up the volume when Cloughie was on the telly or radio. He was fearless and naturally funny. You may have disliked him, but you couldn't ignore him. That would do for him, young man. Brian was a fierce patriot who desperately wanted England to do well. In the summer he died, we watched several Euro 2004 games together and he railed against England coach Sven-Goran Eriksson's timidity and refusal to substitute captain David Beckham. He cared - but I am not sure he would have been successful as England's manager. In 1977, at the peak of his managerial powers, he was interviewed for the England job. The Football Association went for the safe option, Ron Greenwood, who at the time was general manager at West Ham. Years later Clough told me: "The FA knew I thought they were all as weak as dishwater. I doubt if any of the big nobs around the FA's table shared my political beliefs. Perhaps that's one of the reasons I didn't get the job. I tell you what - it didn't go in my favour." But Cloughie would have got bored with all the time between England matches. He hated flying, had no time for dossiers or researching the opposition and would have bridled at all the necessary schmoozing with the media. A diplomatic incident would always be possible when he was riled. How we all loved his comment to Italian journalists after Juventus beat his Derby side in the 1973 European Cup semi-final - Clough suggested that he does not talk to cheats, but in a very colourful way. Above all, Clough loved club management, especially presiding over two games a week. He lived for matchdays. "The best part of my job is when we've won away from home on a midweek night, we've stopped for a bag of chips and then we're having a sing-song on the coach - with all of us having a day off tomorrow. Almost as good as still playing." I often used to think the Forest side of the 1980s was too relaxed at the start of a match. The players would run onto the pitch, seemingly without a care in the world. That was because a Clough team-talk would rarely last a minute - no hairdryers, no ranting. He would place a ball on the physio's couch and say: "That's your best friend for the next couple of hours. Treat it like your wife or girlfriend - caress it, love it." This after making his players listen to Frank Sinatra, Matt Monro or the Ink Spots. The thoughts of that great punk fan, current Forest boss Stuart Pearce, were never sought by his manager. "I had enough of tedious team talks when I was a player," Clough once told me. "Footballers don't have a long attention span; they are instinctive." He would get irritated at the idea of micro-managing footballers and demanded that they relaxed once they knew what was necessary. "Come and see my coaching certificates - they're called the European Cup and league championships," he once said. Above all, Cloughie was respected by his players. For three decades after he left Derby in 1973, he was a regular presence at the old players' association functions, delighting in telling anecdotes and enquiring after the various families. Cloughie was a better listener and conversationalist than his egotistical image would suggest. Republic of Ireland boss Martin O'Neill once told me that Clough had been his biggest influence. "It was one of the great myths that he was a manager, not a coach," O'Neill said. "Every day was a coaching lesson from Brian Clough. You'd pick up something that would last you a lifetime." It is now more than 20 years since his retirement, 10 years since his death, but I cannot think of a single player of his that has criticised Clough in the media. Yes, many were wary of him and some disliked him, but they all respected his unique talent and knack of making them better at their job. Clough hated players surrounding referees and haranguing them - and in turn referees loved coming to the City Ground, where they were treated with respect by the staff. "Discipline in football is too important to be left to the players," Clough once told me, as I gently suggested that Forest's fair but manly style of play was being steamrollered by ruthless, over-physical opponents who happily beat up referees verbally. "I wouldn't say I was the best manager in the business. But I was in the top one." On his own success. "If God had wanted us to play football in the clouds, he'd have put grass up there." On the importance of passing the ball to feet. "We talk about it for 20 minutes and then we decide I was right." On dealing with players who disagree with him. "Don't send me flowers when I'm dead. If you like me, send them while I'm alive." After the liver transplant which extended his life. "Anybody who can do anything in Leicester but make a jumper has got to be a genius." His tribute to Martin O'Neill, who used to manage Leicester City. "I thought it was my next-door neighbour because I think she felt that if I got something like that I would have to move." Guessing who nominated him for a knighthood. "I want no epitaphs of profound history and all that type of thing. I contributed. I would hope they would say that, and I would hope somebody liked me." On being remembered. Once Peter Beardsley had his shins raked by Forest's Netherlands international Johnny Metgod. It was missed by the referee but not by Clough. He hauled off Metgod, gave him a rocket and made him apologise to Beardsley. It remains one of Beardsley's biggest regrets that he never played for Clough, as he admired his footballing principles so much. So too did the great referee Jack Taylor, who wrote to Clough when he retired in 1993. "I'd never done that to a manager but I felt I owed it to Cloughie on behalf of all referees," said Taylor. "He was a great man." Perhaps that's one of Clough's greatest legacies, the fact that his sides let referees get on with their job. I have no doubt he would still pursue the same philosophy today. He would say: "Discipline was a simple matter to me. I imposed it and the players did what they were told." Some of Clough's managerial contemporaries wondered if that idealism rebounded on him. Former Luton, Leicester, Tottenham and Sheffield Wednesday boss David Pleat told me: "His was an incredible stance when you see what goes on elsewhere and the advantage that is sometimes gained by it. "A lot of managers have become winners by allowing that to go on." Cloughie was always very kind about the personal lives of those he allowed into his confidence. When he heard my mother was dying of cancer in the summer of 2004, he sent her flowers and a touching note. Four days before he died, we talked for the final time. He was in hospital - just for routine tests, I thought, although he had lost weight alarmingly. We were due to sort out our usual monthly column for a football magazine and he rasped out his thoughts in familiar forthright fashion - give Sir Bobby Robson support after his dismissal at Newcastle ("let's give him the support and kindness he deserves") and railing at Paul Sturrock's sacking by Southampton after only 12 matches. After we had tidied all that up, he suddenly said: "Give your mam my love and tell her to get out of hospital. They're not much fun." Sadly, Brian didn't make it out himself. I did the last formal interview with Brian a few weeks before his death. "That Frenchman needs a list of all the opticians around Highbury and Islington, because he never sees 'owt when his players are being naughty on the pitch." When the interview was over and Brian dutifully took some more pills, his 14-year-old grandson Stephen, who sat in on the interview, said: "That was great, Granddad!" I've often wondered why he let Stephen stay with us while we did interviews. He was touchingly devoted to the boy and I suspect he knew it would be the last time he'd hold forth to a microphone. And Stephen was right - it was great. And so was his granddad.